Are you missing - by chance - a corner counter? Is your kithcen clogged by odd signs reading "Get the Multi-Junction"? 06 NOV 2006 - UPDATED: "CounterCulture" Multi-Junction. The right-handed "X" junction has been given a new UVmap: now the top lines up perfectly with the adjacent counters (the improvements are mostly visible when the "StripedWood" recolours are used for the top). In order to use these Multi-Junctions, it's not required to download anything else: they work perfectly even with the Maxis original counters. But of course these Multi-Junctions look at best with the CounterCulture Modular Set, the Way Coolinary Modular Set and the Chez Moi. 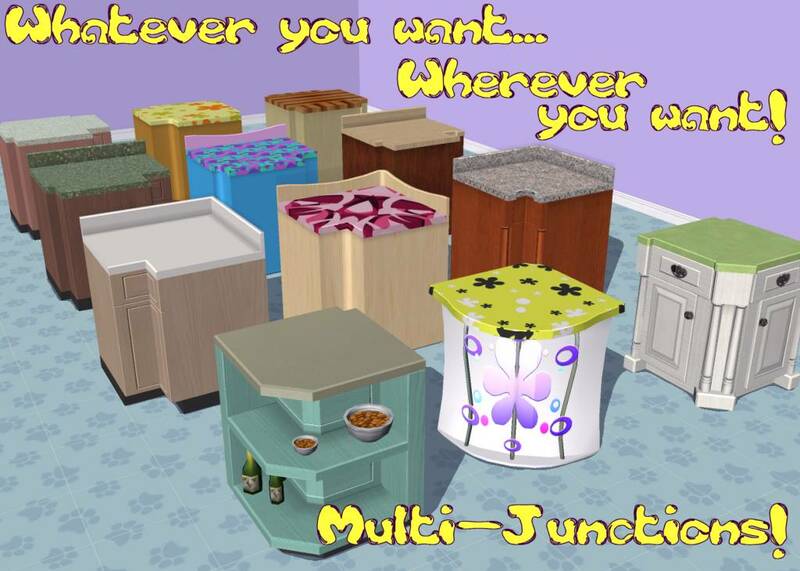 You can put on the Multi-Junctions any small appliance, electronic device, etc, but not the coffee machines (neither the large nor the small one): the sims can't use the coffee machines if placed on the Multi-Junctions. As soon as you pick the multi-junction from the catalog, it's in auto-mesh mode: the mesh will change automatically, according to the walls that are detected near the junctions; moving the junction around will cause its shape to change continuously. Then, when you go to Live Mode, the auto-mesh feature will be permanently deactivated, and the shape can be changed at will using the pie menus. Change Model: lets you choose between L-Junction (the standard corner used also by Maxis counters), T-Junction (to connect two rows of counters in a T position), X-Junction (to connect two rows of counters crossing in the middle), and Inverted L-Junction (to create convex L-shaped angles, or used as terminal of a row of counters). Back Trim: lets you trigger the backtrims (i.e. the backsplashes) up and down; according to the chosen model, you can have the option to hide/reveal one or two backtrims (or none, for the X-Junction). Orientation: the T-Junction and the X-Junction can be "flipped" horizontally, to better match your counter configuration; you can choose between Left-handed and Right-handed. 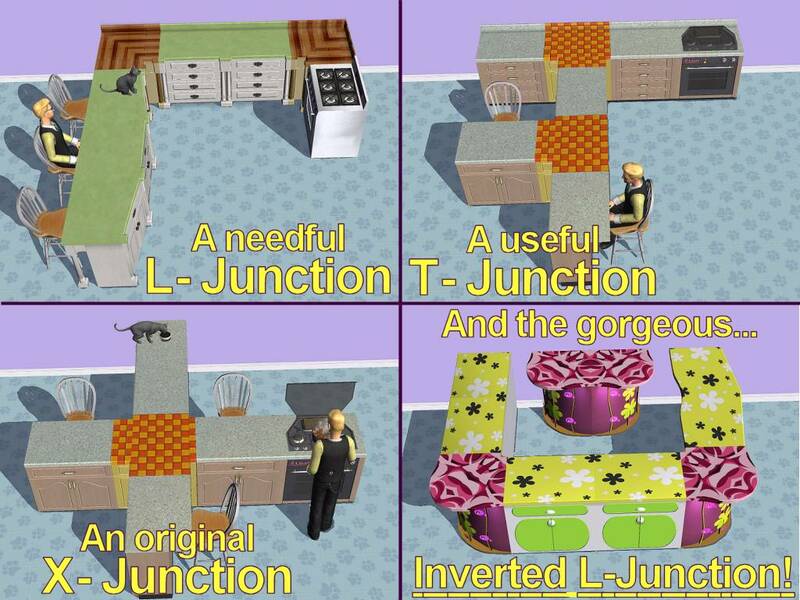 HINT: the most efficient way to use the multi-junctions is to start placing the normal counters, leaving empty the places where the corners are needed; then buy the multi-junctions, filing the empty spaces in your counters, and lastly go to live mode and adjust the multi-junction as desired, using the pie menu. there are many users that build lots without sims, and therefore can't go to live mode and access the pie menu. The multi-junction have an two more automatic functions that help in these cases; both functions are activated using the "Pick & Drop" tecnique. If the junction is in the middle of the room, you can cycle between Inverted L-Junction, Left X-Junction, Inverted L-Junction (again) and Right X-Junction. If the junction is near a flat wall (not corner), you can cycle between: Left T-Junction and Right T-Junction. The Pick&Drop won't have any effect if the junction is placed in a wall corner. 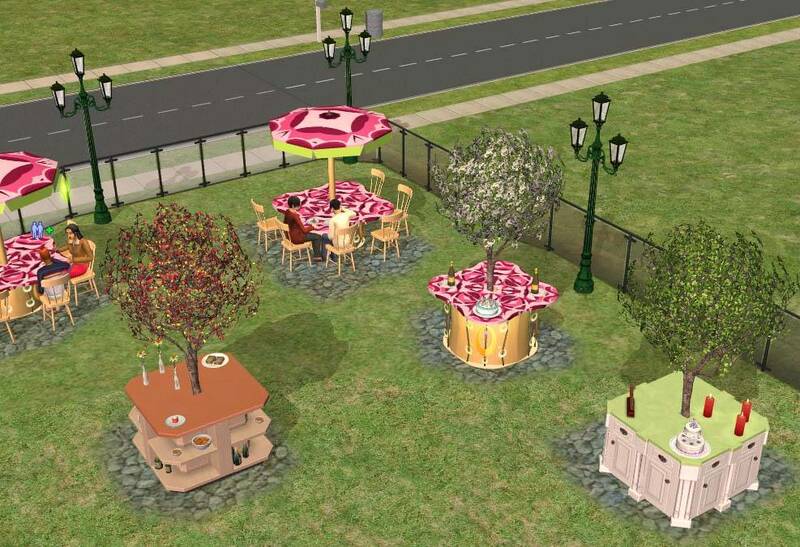 The "CounterCulture" and the "Chez Moi" Multi-Junctions are compatible with any game, from the base game to Pets. Unpack the files to your Downloads folder (or use the Q-Xpress). All the Multi-Junctions borrow the textures from the corresponding original Maxis counters (CounterCulture, Way Coolinary, Chez Moi): therefore, if you want to recolour our set, just create a recolour for the Maxis counter. On the other hand, every recolour for the Maxis counters that you may already have in your Downloads will be automatically available for the corresponding Multi-Junction. Maxis for the original CounterCulture, Way Coolinary and Chez Moi counters.